Adapted from Holling C. Holling’s classic, Caldecott Award–winning children’s picture book of the same name, originally published in 1941 and still in print today, Paddle to the Sea is director Bill Mason’s paean to nature. 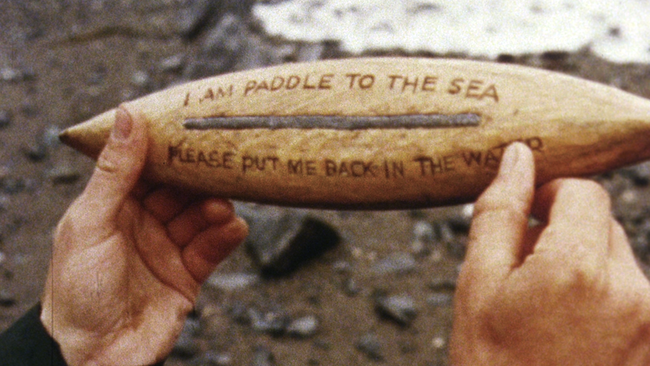 Following the travels of a tiny, wooden canoe from a cabin in the Nipigon woods of west Ontario to the expanses of the Atlantic Ocean, Mason’s film, like the carved toy boat itself, is subject to the tides and turns of the ever-changing earth. “Paddle to the Sea” is the ultimate passive protagonist: whittled by a young boy from a piece of pine and carrying an expertly carved Native American figure, the foot-long form glides and floats with the whims of nature, its face ever smiling, even when encased in wintry ice. The film was a labor of love for Mason. The Winnipeg-born photographer and canoe aficionado adored Holling’s book for its fanciful yet reality-grounded storytelling, and successfully pitched a big-screen version to the National Film Board of Canada. Covering a distance of twenty-two thousand miles over a period of almost two years and in every season, Mason took the exact route through the Great Lakes and down the Saint Lawrence River illustrated in the book—both a visualization of Holling’s work and a pilgrimage. The precious yet resilient Paddle to the Sea (inscribed on the bottom with the instructions “I Am Paddle to the Sea—Please Put Me Back in the Water”) begins its journey on Lake Superior and makes its way down through the rest of the Great Lakes to the Atlantic Ocean, photographed by Mason and his small crew from ground, snow, and water level (the last with the aid of an improvised raft constructed from an inner tube and cord). The most dangerous part of the shoot was, unsurprisingly, at Niagara Falls, where Mason dropped his 16 mm camera, secured by a line anchored to a telephone pole, eighty feet down the fierce waterfall. The filmmaking adventures notwithstanding, Paddle to the Sea is perhaps more remarkable for the patience and contemplative silences of its storytelling, beautifully typified in the placid exterior of its impervious main character. Though it’s never fully anthropomorphized by the film’s narration, the piece of wood becomes a character in its own right. Even when threatened by curious wildlife, including sea snakes, gulls, and frogs, or the looming machinery and pollution of mankind, Paddle simply smiles, an oasis of serenity amid nature’s unstoppable, alternately merciless and merciful, flow. In one of Mason’s most extraordinary moments, the tiny carved figure floats, still and upright as ever, silhouetted against a sky of blooming Fourth of July fireworks in Detroit harbor; he’s either oblivious to these odd, man-made pleasures or watching intently with alien awe, but the narrator refuses to impose a reading. It’s this ambiguity that makes Paddle to the Sea an enduring classic—as with so many of the great works of children’s literature and film (The Red Balloon, The 400 Blows), the main character’s future is as undefined as the wide blue ocean.